Pulling up for my spa day at Deer Valley Montage in Park City, Utah. Deer Valley Montage in Park City, Utah, especially during wintertime, is a majestic scene to behold. The resort houses 220 guest suites and residences with a luxurious yet cozy atmosphere featuring dark wood and stone accents. Families of skiers ready to hit the slopes were bustling about as I pulled up to the huge front doors and enjoyed complimentary valet service. The entrance to Spa Montage. Men and women’s relaxation lounges, featuring lounge chairs and cozy fireplaces. Men and women’s steam and sauna areas; whirlpools and a cold deluge. Co-ed relaxation space with a 25-meter lap mosaic pool and whirlpool (can be enjoyed by hotel guests of all ages). A total of 29 treatment rooms including couple rooms, traditional Thai rooms, 2 Vichy shower rooms and 2 hydrotherapy rooms. Incredible mountain views and fresh-air balconies. Stunning décor including photography by Fatali. Privacy partitions in relaxation lounge and salon. Luxury reclining shampoo chairs in the salon. State-of-the-art fitness equipment, daily private and group fitness classes. Spa amenities can be enjoyed by all overnight guests over the age of 16. A Thyme’s Frasier Fir candle burns at the front desk, creating the perfect ambiance. I made my way to the resort’s alpine-inspired, 35,000-square-foot Spa Montage on the fourth level and inhaled the scent of a Thyme Frasier Fur candle burning at the front desk. I was greeted warmly and ushered into the impressive locker room, where I was given a lush robe and slippers and shown all the amenities. A friendly spa attendant pointed out a full vanity room equipped with hair spray, deodorant and other toiletries. I was also shown the showers, steam room, sauna, cold deluge, and a gorgeous whirl pool—all within the women’s private locker area. I then made my way to the cozy relaxation lounge, where I enjoyed refreshing water enhanced with orange slices, granola and tea while snuggling under a warm blanket. I could stay here all day! Kicking my feet up in the relaxation lounge pre-treatment. Another view of the relaxation lounge. Not pictured: a crackling fire. Christine, the lovely massage therapist performing my service, showed me to the treatment room, where I took a moment to enjoy the view on the balcony. She provided a quick overview of the body treatment I would experience, Lavender Dreams, (90 minutes/$325), then stepped out as I slipped under the sheets. The treatment began with brisk but comfortable dry brushing on my legs, arms, abdomen and back; brush strokes were applied in the direction of my heart to increase circulation, decrease toxins, and remove dead skin cells. Next, a fragrant lavender scrub from Kerstin Florian was scrubbed all over my body as I relaxed and kissed any traces of scaly skin goodbye. Professional products from Kerstin Florian used during the Spa’s Lavender Dreams body treatment. After the scrub, Christine expertly and professionally removed the towels I laid atop, all while keeping me securely draped. I was now nestled into fresh sheets, feeling the warmth from the heated treatment table to enjoy a full-body massage with therapeutic lavender massage oil. Warm stones were used to add extra comfort for my back and feet, and a lavender-infused pillow was gently placed over my eyes as I turned onto my back. I’ll admit, I was so relaxed that I drifted in and out of a lavender dreamland during parts of the service. As always, one of the most calming parts of any spa service is the scalp massage. Christine not only massaged my scalp but she also applied a leave-in Kerstin Florian hair mask, which I was instructed to rinse out at home. I was silky, smooth, and shiny from head-to-toe! A lovely view of Deer Valley Montage from the treatment room balcony. After the treatment ended, I was given the dry brush that was used during my treatment, along with an informational booklet that contained instructions on how I could dry brush at home, in addition to extra lavender body scrub. This was a wonderful touch, especially since I’m a big believer in doing everything you can to maintain treatment results at home. Still floating from the scrub and massage, I received a tour of the rest of the facility, including the salon and fitness center. The posh salon has hair and makeup stations, and manicure and pedicure offerings. Deer Valley Montage is no stranger to high profile clients and celebrity guests. 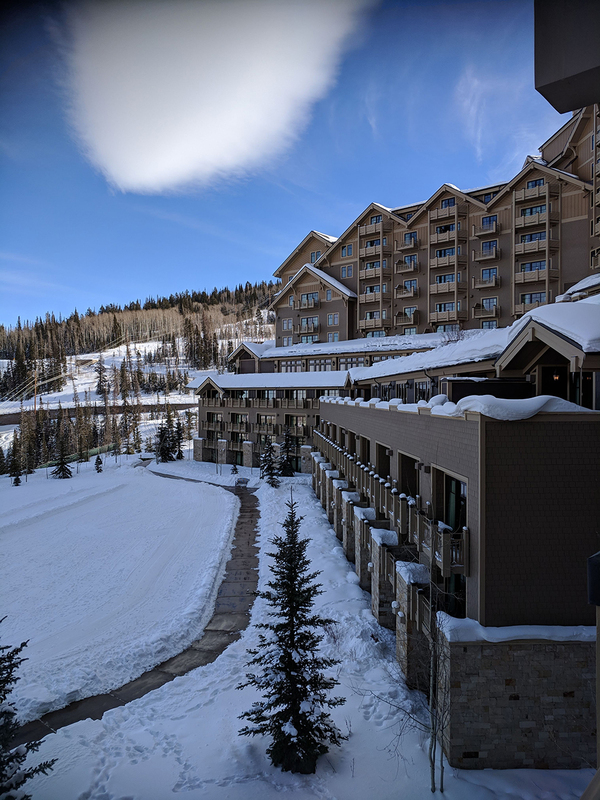 The Sundance Film Festival usually held in January is an especially busy time for the resort and salon and spa as A-listers flock into Park City to attend films and events. Spa Montage accommodates, offering extra privacy partitions, so guests can be sure they can relax while keeping a low profile, if desired. Say “goodbye” to neck kinks with these smart shampoo recliners and “hello” to a gorgeous new ‘do. 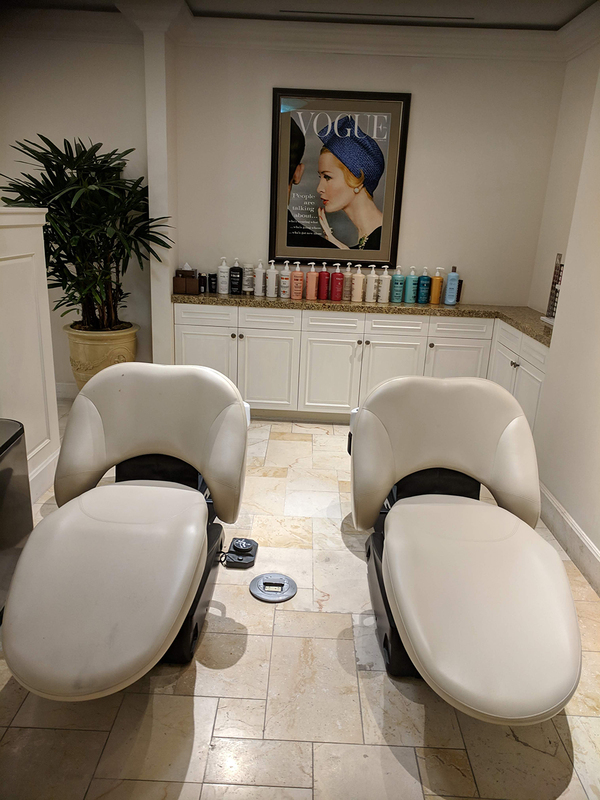 The salon’s shampoo chairs are not only luxe, but extremely functional; eliminating the ever so common neck kink that typically accompanies a wash. Vintage Vouge covers line the walls, giving the space a glamourous feel. 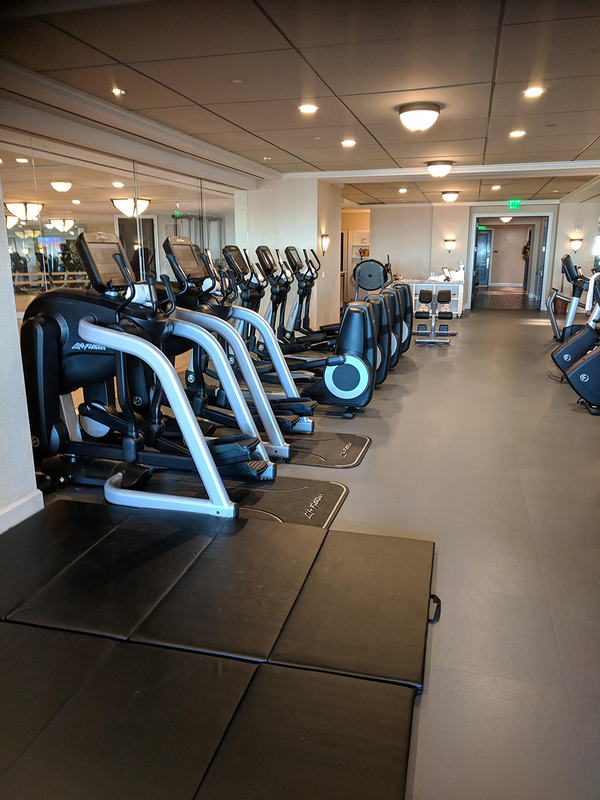 The fitness center offers the most state-of-the-art equipment including daily private and group fitness classes guests can attend. This wellness space is truly a one-stop-shop! Spa Montage’s fitness center has everything you could ever want while working out. The next stop was the breathtakingly beautiful mosaic lap pool in a vast co-ed relaxation space with an adjacent whirlpool. Clients can relax and enjoy food poolside, making it the perfect backdrop for a girl’s weekend or bridal party. The co-ed indoor lap pool is designed with high-end mosaic. The whirlpool also features a stunning mosaic design. I then peeked inside the Serenity Couples Treatment Room, which is the ultimate #couplegoals. It features two copper tubs, dual treatment tables, a private bathroom and beautiful alpine views. The space can be reserved for the entire day or just part of the day by couples and small groups. A look inside the Serenity Couples Treatment Room. Dual copper tubs in the Serenity Couples Treatment Room. The spa’s serene décor included exquisite photography highlighting the Southwest by artist Fatali. Dozens of his pieces were artfully placed throughout the spa, giving it a balanced and cohesive feel. The spa is sprinkled with Fatali photography depicting scenes of nature’s beauty. On my way out, I spent a few minutes in the spacious spa boutique. It’s beautifully designed with an array of clothing, jewelry, candles and professional brands including Kerstin Florian, Tata Harper, Valmont, Jack Black, Clarisonic and Nuface. The perfect place for any last-minute spa shopping needs! The boutique in Spa Montage is a spa-goer’s shopping haven. Arrive early to enjoy the spa’s amenities pre-treatment. Don’t forget to bring a swimsuit for the whirlpool and lap pool. Spa Montage is open daily from 8:30 a.m. - 7:30 p.m. with treatments available from 9:00 a.m. - 5:45 p.m.
Alisha Racker’s beauty career has spanned over a decade as she's worked as a master esthetician, skin care PR-pro and freelance writer. She lives in the beautiful mountains of Salt Lake City with her husband and daughter.